it only works if some window is focused, it will NOT work if you don't have any window or if no window is currently in focus. Furthermore even if a window is focused, it apparently has to be the right kind of window, e.g. for some reason it does not work if chrome is focused, but it will work if gvim is focused, WTF?. Then give it a shortcut from System Preferences. There's a bug that prevents newly assigned keyboard shortcuts from working until you view the Services submenu in an application. Alas, that workaround doesn't work for the Terminal services, because they never appear in the Services submenu—they only appear in the contextual menu. For other Services, another workaround is to assign a key to the menu item via App Shortcuts instead of via Services (both are in the Shortcuts tab in the Keyboard system preference panel). However, although the shortcut appears in the contextual menu in Finder, and it even works while the menu is visible, it has no effect unless you're viewing the contextual menu. 1) should work, but the Folder has to be selected (focused). It's not enough to just be in a folder and have nothing (or a regular file) selected. Select a folder in finder, if you activated the checkbox under Syspref > Keyboard > Shortcuts > Services > new terminal at folder you can also see the menu entry at Finder > Services. 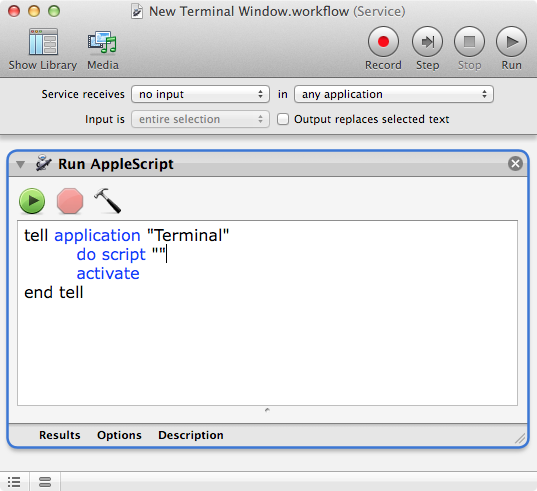 create a new service, select no input at service receives, add the Launch Application action and select Terminal.app. Now save the the service and go to System Preferences > Keyboard > Shortcuts > Services, the just created service should appear at the bottom with the name as you saved it. Add a keyboard shortcut and you then can start Terminal from any app with that. Not the answer you're looking for? Browse other questions tagged macos mac terminal keyboard-shortcuts or ask your own question. How to assign a keyboard shortcut to a specific New Window template in Terminal.app? All undocumented keyboard shortcuts for OS X terminal app? Is it possible to change or override the default keyboard shortcuts in Finder? How to make Windows custom keyboard shortcut launch new program instance every time it is invoked? Gmail has taken over an important keyboard shortcut (cmd+<), how can I override this? Mac keyboard shortcut to focus the main HTML document/window in Chrome?